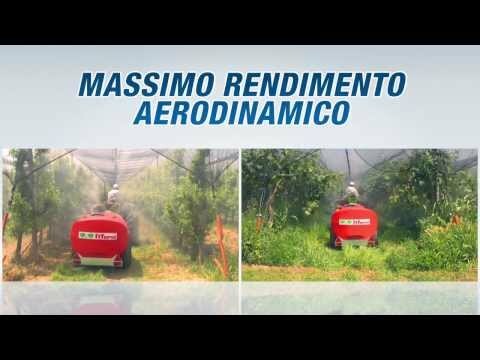 Want a Trailed sprayer 1000 L, very low, very compact, with a very powerful Fan Front and 10 other major innovations? Propeller with Air volume adjustable in 6 sec. Electrostatic Charge (E±S+) integral, high density. - Turbo-Vario 33/XL: Spray Power adjustable up to 51.000 mc/h. - Turbo-Vario 33/XV Super: Spray Power adjustable up to 66.000 mc/h. Fan on the Front side: Higher Aerodynamic Performance. Emission towards the rear. No spray mist to the tractor. 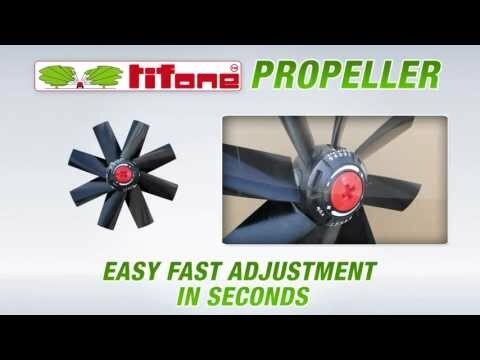 Instant easy Propeller adjustment: in just 6 seconds. Immediate access and control to the pump. Immediate access and control to the Gearbox. Short pipelines: Minimal pressure drop from the pump to the nozzles. And a minimum Technical Residual. No tube nor driver shaft through the tank: Improved mixing. Adjustable Top deflectors to avoid undesired diffusion and air Drift in the centre of the row. Manual or Remote adjustment by push bottom. Anti-mud function by integral slide Keel. The front side Turbofan allows the disengagement of the tractor PTO before turning out, at the end of row. Adjustable flow rate of 50 litres per hectare up. Suitable for Plantations with row spacing up to 5 m and up to 5 m high. and more. Weight Transferred to the tractor: 145 kg = Reduced the weight on the wheels. Low centre of gravity, increased stability also in sloping ground. Compact. Back of tank nicely rounded = easy tight turning. No risk of damage to the Turbofan in tight turning. The machine complies to Directive 127/CE 2009. Absolutely no intake of leaves and dust from the ground. Absolutely no recirculation of spraying mist. Sucking PROBE for the pesticide dosage, Powder and Granular: Sucking and dissolving them instantly and downloading within the screen of filling hole of the tank, in total security for the operator. TIFONE Electrostatic Charge (E±S+) High Polarisation System. The Easy Vario is available in 3 Versions: TURBOFAN, TORRE Anti-Drift and CANNON. Spray Power adjustable up to 66.000 mc/h. TIFONE Electrostatic Charge (E±S+) High Polarisation System with ANTI-DRIFT + ANTI-POLLUTION Technology. with Fast adjustable "Axial Propeller"